Sugar and spice and everything nice…that’s what this Autumn Spiced Sweet Mashed Potatoes recipe is made of! An easy side dish, perfect for fall! My little guy loves sweet potatoes! Whenever we have steak or burgers, he doesn’t want white potatoes or tater tots…nope! He wants some form of sweet potato. Gosh, I love that! Sweet potatoes are SUPER healthy and good for you! Whether it be baked or mashed, he’s all for sweet potatoes! When I made this dish the other night, he ate all his dinner and cleaned his plate! He then got up as he normally would to put the plate in the sink but instead grabbed a spoon from the utensil drawer and the big serving bowl of sweet mashed potatoes. He walked back to his seat and started eating straight from the serving bowl! I guess he really loved this recipe! I’d say this recipe passed the kid test with flying colors! Sweet potatoes are a great source for beta-carotene, which is an antioxidant. We need antioxidants to keep our bodies healthy and to help fight against illnesses. And guys…this recipe has such an amazing taste because of how you cook the sweet potatoes with the whole cloves and the cinnamon stick! Typically when you think of someone making mashed sweet potatoes, you think of them peeling the potato, boiling them until soft and then adding the brown sugar and spices to mash. Well…not me. I peel the sweet potatoes and then boil them with the whole cloves, cinnamon stick and brown sugar. Preparing the sweet potatoes this way helps the flavor really penetrate into the sweet potatoes. It’s fabulous! This dish is perfect for the fall season and goes well as a side dish for one of your upcoming holidays, like Thanksgiving and Christmas! This recipe is gluten free and dairy free! Enjoy this one…the flavor is so different and you are going to love these! Oh, and if you love potatoes, you have to check out my recipe for my Perfect Homemade Mashed Potatoes, Slow Cooker Herb Roasted Garlic Potatoes and my Zesty Italian Potatoes! Sugar and spice and everything nice...that's what this Autumn Spiced Sweet Mashed Potatoes recipe is made of! An easy side dish, perfect for fall! Peel the sweet potatoes and cut into bite-size pieces. Rinse well and set aside. 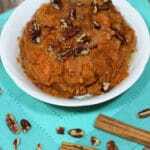 In a large pot, combine the sweet potatoes, brown sugar, cinnamon stick and whole cloves. Add enough water to cover the potatoes. Bring potatoes to a boil, until they become tender (about 20 minutes). When done, drain the potatoes and add to a large mixing bowl and set aside. Discard the cinnamon stick and the 2 whole cloves. Melt the butter in a medium saucepan. Stir into your saucepan the ground cinnamon, salt and ground clove. Once your butter mixture is well mixed, pour the butter mixture over your cooked sweet potatoes and mash with a hand masher until the desired consistency. I like these fully mashed but some people like them a little chunky. Top with your favorite toppings, such as pecans and raisins! Pin this AUTUMN SPICED SWEET MASHED POTATOES recipe to your SIDE DISH or FALL FAVORITES board on PINTEREST! I think your little fella and I would get along! This is probably my favorite side dish on the planet! I know! 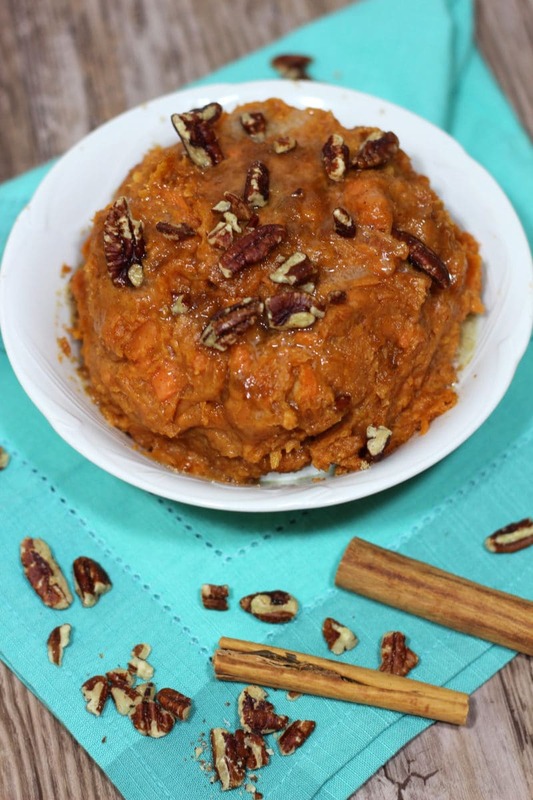 I’m in love with any sweet potato dish and this one is amazing!! Cloves are such a fun spice for the cooler months of the year. Love how fragrant they are – I bet they’re SO good with the other spices you have going on here. YUM! Yes – the clove is wonderful in this dish! you’ll love it!! OMG….seriously I would just eat a bowl of this for dinner. Love the flavours happening here….and this is the perfect holiday side dish for company too. Yes – it’s the perfect side dish for Thanksgiving and Christmas dinner!! I loooove me some mashed potatoes! The rest of my family doesn’t particularly care for them, but I can’t get enough! Love how you spiced these and added pecans! Delicious! Thanks! These are such a crowd pleaser!! 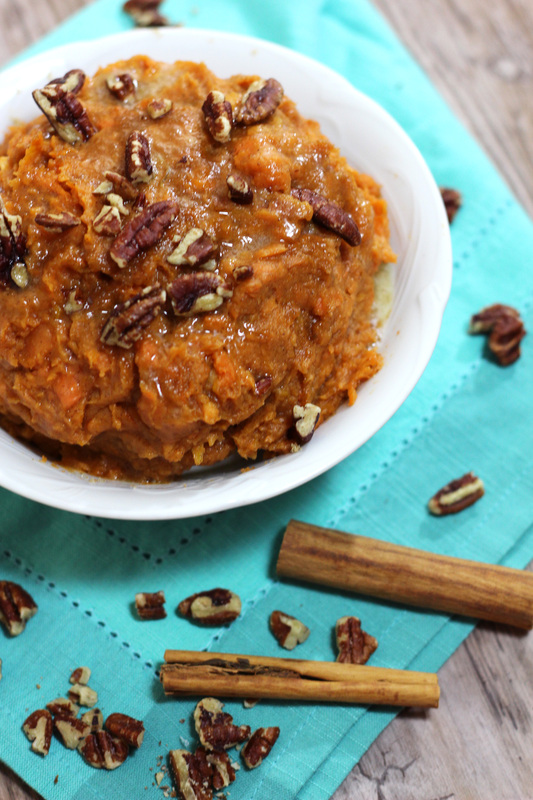 I love adding pecans to sweet potatoes – they’re a match made in heaven! Yes and pecans are so readily available this time of year!! sounds like a great side! Oh my goodness, this is one of my favorites ever. I’ve been to enjoy it as dessert too! Love ’em. Yes- they really could be eaten as a dessert! Sweet potatoes are always better than regular potatoes! These look like a lovely take on a classic dish. Yes!! This is a classic dish and it’s so divine! This is my all time favorite side dish! I love how velvety it is and that it’s full of cinnamon! Thanks! You’re going to love it!